You’ve read articles 1 and 2 in this series and you feel you’re ready to have a go at the work. Well, you’ll be pleased to know its actually quite easy. The most complicated part is planing the rough wood and ending up with a nice flat surface, so how hard can it be? Firstly, plan out how big you want the table to be. 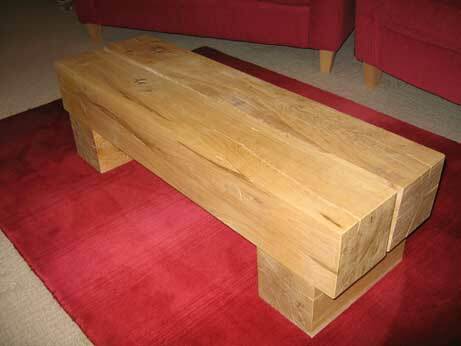 I was planning on a table of about 1 meter long with two beams for the table top and two much shorter sections of wood for the feet. Order more wood than you need because you may make mistakes or else decide on a larger table. You can always take away from the wood but adding back isn’t as easy. English Woodland Timber just outside Midhurst, West Sussex were able to supply me with all the wood I needed at a very good price. 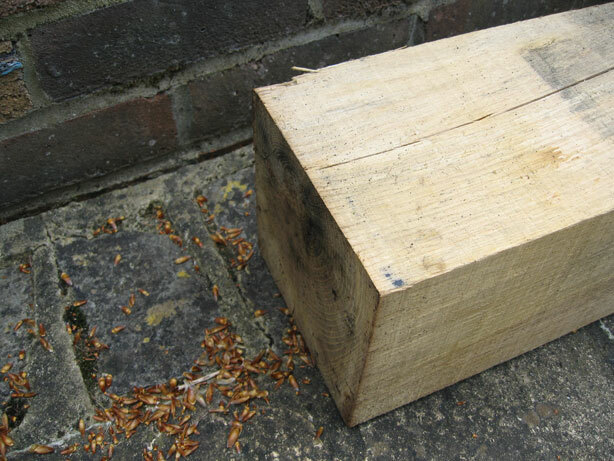 I bought two 1.8 metre beams of rough sawn wet oak for around £58 inc VAT. Each beam was 160mm square in cross section. To make the table I needed two table tops and two feet so with each beam I intended to make one table top and one foot with a little bit left over. When I phoned in my order I was told that the cutting process would leave both ends of the beam looking rough and not necessarily square so I’d probably be best off trimming those. True to their word both ends of the beams needed trimming so I was glad I’d allowed extra wood in my measurements. I’ve had this particular section of wood for a while now so it’s beginning to crack as it dries. You should get fresh cut oak that is still a little ‘wet’. Either way you’ll notice that the surface of the wood is very coarse. Don’t worry, we’ll be sorting that out shortly. Once you have your wood start to mark up. Whilst marking up use a ‘Try’ square like this to keep the lines you’re drawing straight and at the right angle. Remember to measure twice and cut once, its easy to make mistakes. If you can rope in some assistance with picking up and moving the wood as dropping it almost certainly mark it beyond easy repair. You may also do yourself or someone else an injury with the wood. Its heavy just remember that. Take your time over the actual cutting. Making a mistake here means you may have to adjust other parts of the project. Keep the saw on your marked line and on the ‘waste’ side of the line i.e. that part of the wood you’re going to discard later. Keep the sawing motion as even as possible and try not to stop and start too many times as this will leave marks or steps in the wood. Once you have a section of wood spare from your cutting you can practice planing and sanding it. 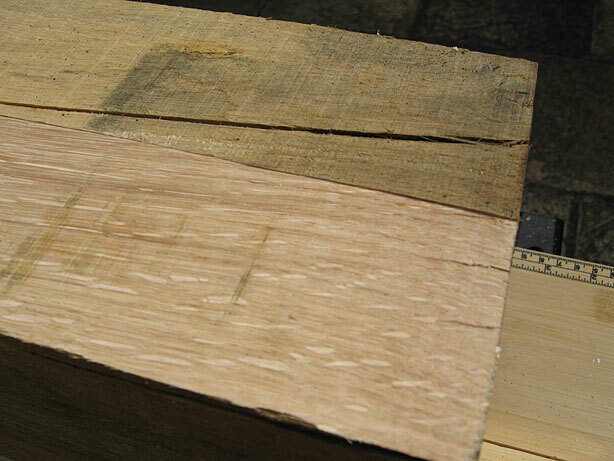 Here you can see the difference between the rough sawn oak and the newly planed section. You’ll notice that there are still some rough lines to the left of the picture, this is because the wood is not even. 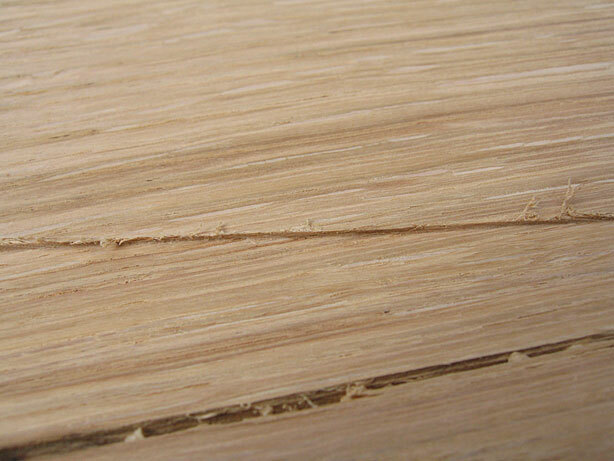 Don’t worry about these, you’ll be planing the wood several times per side and these lines will disappear. Here the plane has bitten deeply into the wood and left a large step. Luckily its at the edge of our test piece so it’ll be easy to remove. 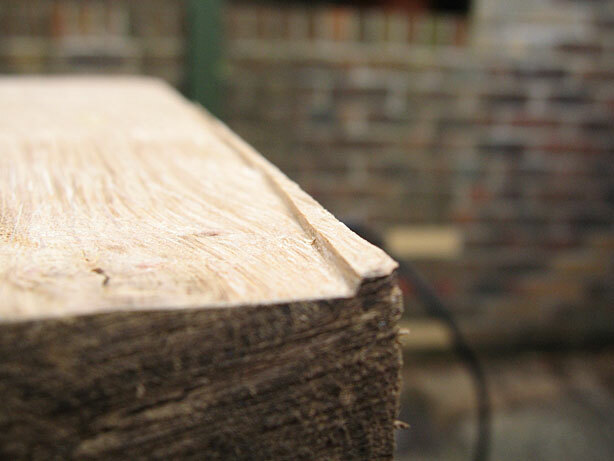 If you do this in the centre of the beam you’ll have lots of wood to plane to even things up again. You’ll notice that, as careful as you are, you still get steps in the surface of the wood. You can try setting the height of the blades to less than 1mm but you’d be better off using your scraper to even out the surface. 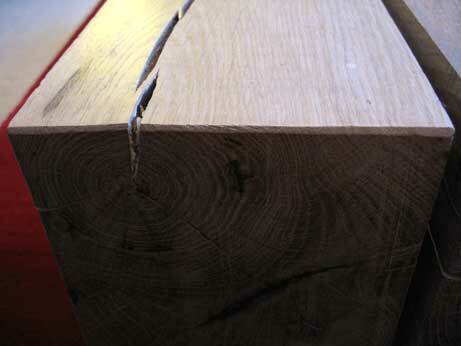 A step in the wood caused by planing. 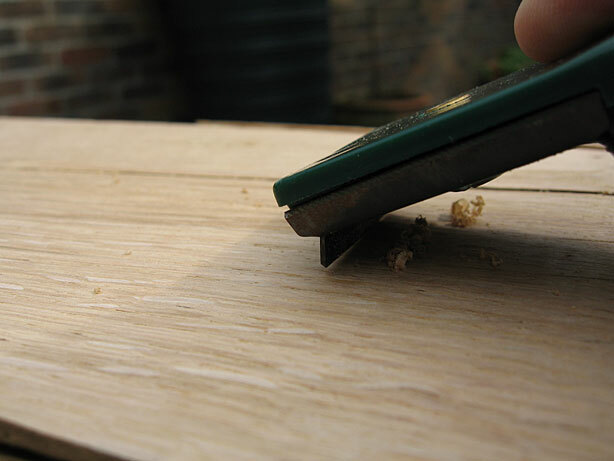 Holding the scraper at a slight angle press down and draw it along the surface of the wood directly on top of the step. Keep doing this lots of times until the step disappears. After planing all the sides of the wood test piece you’ll need to sand it. Try starting with a fine sand paper in an orbital or belt sander. Don’t use a sanding attachment for a drill as they are far too rough. Using your sander or, if you’ve got arms like Popeye, by hand, work over each side of your test piece several times. If you find the sanding process is leaving marks on the wood try using a finer grade of sand paper. The last task is to use the rasp to clean off the edges on the ends of the beams. Don’t be too vigorous with the rasp as it’ll bite into the wood very easily and leave you with a very chamfered edge. Afterwards, if necessary, go over the chamfered ends with sandpaper to clean them up even more. If you’re happy with the results you’ve achieved on your test piece start work on the rest of the table parts taking care with each one. Once all the parts have been cut, planed and sanded you simply need to move them to where you want to assemble the table. In this project I decided not to fix the table top to the feet because the tops were heavy enough to withstand knocks without moving much. Since having made the table it hasn’t fallen apart or dropped on someones foot once. If you’re concerned that it could then simply drill holes with a large wood bit part way into the feet and table tops and then push a short length of dowel into the holes to secure the tops. You’ll need to mark up the positions carefully so that the table top sits correctly on the feet. Once you’ve lived with the table for a while it is likely to dry out and crack. Don’t worry this is normal and just gives your table a little more character. Good luck with your own project. This entry was posted on Monday, May 8th, 2006 at 11:26 pm	and is filed under DIY. You can follow any responses to this entry through the RSS 2.0 feed. Both comments and pings are currently closed.